Tattoo Pliers: I recommend purchasing 2, it makes the tattoo process go by much more quickly and makes for less risk of putting the sequence in incorrectly. I prefer the Stone Manufacturing pliers as they are the smallest and can fit into even very small week-old Nigerian Dwarf ears. DO NOT use the black ink that comes with the pliers, it’s worthless. Tattoo Alphabet and Number set: I recommend purchasing the complete set of both letters and numbers – consider purchasing 2 sets of numbers if you have more than 20 or so kids a year. First, Remember that the herd sequence is tattooed into the goat’s right ear - that would be the left ear if you are looking straight in to the goat’s face - as you will be when you are tattooing. The unique goat sequence is tattooed into the goat's left ear - your right as you are looking into the goat's face. Place your herd sequence into the first set of pliers. Test it on a sheet of paper, make sure it’s in correctly (it’s counterintuitive as the digits appear to go in backwards – please check it before applying the tattoo – you do not want to have to retattoo later because you got it backwards). Load the kid’s individual sequence into the second set of pliers (the Letter and Number that is specific to this particular Kid). Test the second set of pliers to ensure it is correct. Place a good dollop of green paste onto a sheet of paper or grain tag. Squirt rubbing alcohol over both the toothbrush and the pliers’ digits. Load your toothbrush with tattoo paste and apply it to both sets of tattoo digits (both sets of pliers). Then reload your toothbrush with green tattoo paste. Place the goat into your disbudding box if you own one. If you don’t own a disbudding box, (I strongly suggest you build or buy one), have someone hold the kid that isn’t going to balk at screaming & mad squirming. Clean the inside of both ears with a cotton ball loaded with rubbing alcohol. 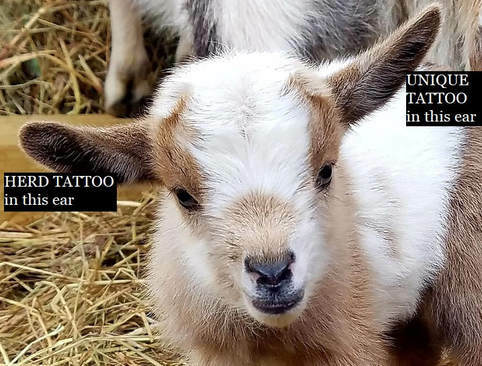 While avoiding the two big veins that run the length of the ear, apply the Herd Sequence tattoo to the GOAT’S RIGHT EAR (that would be the ear on your left if you are facing the goat while tattooing). Press down hard, you will have to literally peel the ear off the pliers – if you don’t the tattoo won’t set properly and you’ll be doing this again within a year. Repeat step 8 with the unique sequence into the GOAT’S LEFT EAR (your right as your are facing the goat) Again, Press Down Hard & peel the ear off the pliers when you are done. Using the loaded toothbrush, scrub ink into both tattoos, then apply a coat of Vaseline on top of each (this keeps the ink in the tattoo). Remove the kid from the disbudding/tattoo box & either give it a bottle or return to it’s dam. CLEAN UP: Remove the tattoo digits from both sets of pliers – gather up all digits used for this tattoo session & put them into the rubbing alcohol bottle. Shake, shake, shake. The Alcohol will turn green, removing excess paste from the digits and cleaning them. Drain the alcohol, reload your herd sequence into a set of pliers and put everything away until next time.